Following the release of an initial reboot of the beloved original property in 2014, Teenage Mutant Ninja Turtles: Out of the Shadows is looking towards reestablishing the titular superheroes for general audiences of the 21st century with more debts paid to the original cult-comic of the 1980s. Coming on the heels of the release of the final full-length trailer, plus plenty of images depicting the movie's new and returning characters, anticipation for the Michael Bay-produced sequel is likely as high is it is going to get leading up to its theatrical release next Friday. Many kids of the 1990s likely remember watching iterations of the original comic book property co-created by writer Kevin Eastman and artist Peter Laird as it had been reimagined in the past for television and film, with the '90s series of live-action films serving to define the look of the Vintage Ninja Turtles on the big screen. Luckily for those fans, the latest footage from the premiere of Out of the Shadows includes a special appearance from those self-same four familiar faces. In the video featured below, 1990s American rapper Vanilla Ice crashes the Teenage Mutant Ninja Turtles: Out of the Shadows premiere with the original Vintage Ninja Turtles of the initial live-action films in tow. What follows is a scene wherein the entire audience bursts into applause as the cast of the '90s live-action movies take the stage while Vanilla Ice begins a live performance of his rap from Teenage Mutant Ninja Turtles II: The Secret of the Ooze, "Go Ninja Go". In the years since comic book creators Eastman and Laird first thought up the concept behind TMNT as an overt satire of writer Frank Miller's then contemporary Ronin comic book run, the Ninja Turtles have become a household name even outside of martial arts-inspired genre fare fans. Given his history with the franchise, Vanilla Ice's inclusion at the world premiere of Out of the Shadows seems only fitting given the surrounding context of the film event in question. If everything falls into place for distributor Paramount Pictures, perhaps the latest Bay-produced feature film production based on a popular property of the '80s will fare well, and Out of the Shadows will be a better adaptation of the original TMNT property then the preceding film from 2014 was. Either way, the Vintage Ninja Turtles and Vanilla Ice appear to be more than willing to embrace Out of the Shadows when it finally comes to theaters next month. 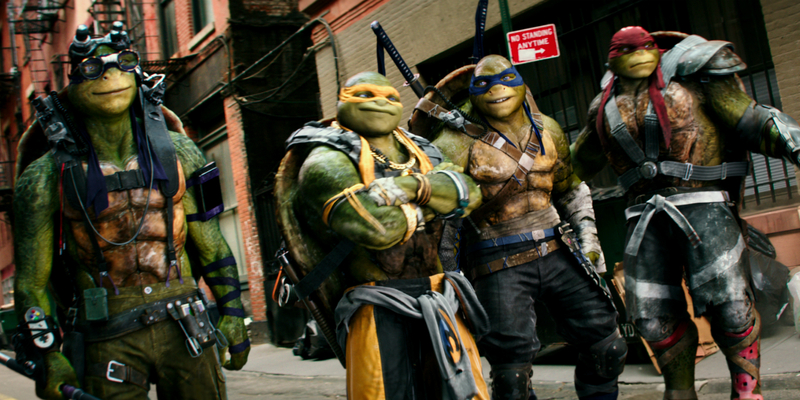 Teenage Mutant Ninja Turtles: Out of the Shadows opens in U.S. theaters on June 3, 2016.